Andrey Medvedev left his native country in order to establish the Russian Chapel Hills Winery in North Carolina. He planted more than just grape vines—he established a community. From Biblical conversions of water to wine, to goblets of mead tossed by the sea into hungry gullets of Vikings; from sweetened port nipped over cigars, to the bottle of Pinot your aunt likes to pass around the Thanksgiving table; wine has united humanity for several centuries’ worth of libations. It’s the sweet honey that turns teetotalers into chummy winos, a tannic and tantalizing refreshment that guides enemies towards friendships. It’s what is surreptitiously sipped in business meetings and on first dates, sealing deals and cementing bonds. It is the communal building block of home dinners and international commerce alike. There’s something about wine that, simply put, brings people together. It’s that inherency of community that first drew Andrey Medvedev to wine, and, in 2010, ultimately culminated in the gentleman’s greatest ambition: Russian Chapel Hills Winery, located in Columbus, North Carolina, about 20 minutes southeast of Hendersonville. Medvedev’s journey had begun a number of years earlier while touring the vines-blanketed hills of Italy and France. He’d studied the culture of the illustrious local industry: the smiles that emerged from the pull of wine glasses; the sharing of bottles, recipes, and knowledge of craft; the quiet similitude of a life of agriculture. And those travels through Western Europe, those vineyards and wineries, sparked something in Medvedev’s soul. Eventually, through the unique uniting of communities across countries and continents, creeds and cultures, and even friendships and love—including a chance encounter with his future wife, Mai—and all melded with the fruity glue of wine, those sparks would turn into a glowing flame as warm and steady as the belly-heat of a cabernet. The story of Andrey Medvedev is as long and winding as the very road that leads to his winery. It begins across oceans and vast lands, in the icy plains of Russia. Or perhaps it begins in an even farther-flung locale, in the dry and dusty windstorms of Afghanistan. It was here, in 1985 and as a soldier in the Russian army, that Medvedev’s life took its first hairpin turn. The 1979-89 Soviet-Afghan War brought Medvedev to Kandahar, the second-largest city in Afghanistan; he was a member of a special forces unit responsible for destroying convoys of ammunition and supplies being shepherded by rebel forces. On a relatively routine day, Medvedev and his companions prepared for an ambush in the hills. He shouldered his pack, slid into ranks, and felt a hand pull him back. The hand belonged to a superior-ranking soldier, who ordered Medvedev to return to camp and noted that he would take Medvedev’s spot in the mission. Medvedev hesitated, protested, and finally obeyed his orders, watching his troop fade into the scorched horizon. Within hours, ten of the soldiers on the mission would be dead. This chilling brush with death, and the sacrifice of his compatriots, inspired Medvedev. “I wanted to build something in gratitude for what those guys did, and in honor of them,” he quietly remembers. “I always wanted to build a chapel, but I didn’t know when.” That tenacious devotion to his friends, and to honor, is indicative of Medvedev’s dignified steadfastness in all things. After he finished his time in the army, Medvedev returned to his native Russia, trading in his barracks for libraries and classrooms at Moscow University. With that signature perseverance, Medvedev buried his head in books and emerged with a law degree. He found success as a corporate attorney, a field as disparate from his former profession in the army as the career that lay ahead, and thousands of miles away, in America. Medvedev’s prosperity in law afforded him myriad opportunities, including the European trips mentioned above. “When I was an attorney, I was traveling through Europe—France and Italy—[and I] saw all these beautiful places and tasted wine,” he notes. It was these experiences—the travel, the tastings, the families, and communities—that developed in Medvedev his self-proclaimed passion for wine “culture.” He grapples with the perfect words to describe his ardor for the industry: “It’s not only wine. It’s complex.” After exploring those vineyards and wineries, and the unique bonds that sprouted in their soils, Medvedev knew he wanted to stake his own claim in the wine industry. Medvedev’s travels—first through Europe, then to Florida, and finally to Western North Carolina—confirmed his resolve to one day own a winery, and while the scenes and history of Italy’s wine region were appealing, the quiet simplicity and kindness of the Carolina mountains hearkened to him even more. It was here that he felt at home. “I feel more comfortable here,” he says, when asked about his decision to start a winery Stateside. “Nobody cares about my accent, plus it was in my budget—many reasons.” Medvedev was determined to trade in his Russian roots for American soils, and his chance to do so arose in 2009. According to Medvedev, the Cecils heard that an existing vineyard in Columbus was for sale, a verdant property called Green Creek Vineyards, and knowing of his interest in establishing a winery, they quickly alerted him. The land was essentially perfect, its rolling hills and established vines the very hallmarks of Medvedev’s dreams. “It’s very well built, it’s very good for grapes, and it’s a nice climate,” he says. “And of course, I asked advice from Biltmore Estate—people who really know it.” Without considering any other properties in the region, Medvedev extended an offer to purchase Green Creek Vineyards. Despite the seemingly serendipitous events leading up to Medvedev’s purchase of this particular piece of land, the process of actually doing so was anything but easy. The vineyard and winery were owned by the two Pack brothers: Marvin, who established the vineyard in 2004 when word of Western North Carolina’s fertility for grape vines began to spread; and Alvin, who forged the Green Creek Winery on a section of acreage nearby. By 2009, however, Marvin had resolved to sell the vineyard, although his brother opted to retain ownership of his winery. Haggling, offers, and counter offers flashed back and forth between Medvedev and Marvin, who had taken note of Medvedev’s intriguing history and his perceived association with Asheville’s elite. But later that year, the two finally agreed to a sale: $340,000 for nine acres of vast and fertile vineyards. Even as Medvedev began the lengthy transformation that would turn Green Creek Vineyards into Russian Chapel Hills Winery, including additional acres of vines and a new tasting room, Alvin Pack maintained Green Creek Winery on his neighboring parcel of land. Despite the potentially confusing misnomers, the two businesses operated separately, and Pack’s winery, located about five and a half miles from Medvedev’s, continues to this day as a popular stop for wine tourists. By the time Medvedev was finalizing the sale in 2010, the vines of Green Creek had actually gone unused for years, the sweet fruit wasted on the vine rather than bottled into dark bulbs of glass. “He didn’t make wine anymore, for a while, for five years,” Medvedev says, of the vineyard’s previous owner. But that was all about to change. As Medvedev settled into his new home, he began to learn the intricacies of his land—the vines, the farrows, the sun, shade. He also became acclimated and attuned to nearby towns like Hendersonville. He explored local shops and restaurants, finding favorites like Umi Sushi, where he became a regular. But it wasn’t just the food that brought Medvedev back again and again—it was the eye-catching visage of the restaurant’s co-owner, Mai. When asked about the woman who became his wife, Medvedev blushes. “It’s a fun story,” he says with a laugh. “I was her loyal customer for a long time…” His voice fades, culminates in a smile. It’s the quiet kind of romance that words don’t quite capture. Mai’s work ethic and success, and her passion for the community and local culture, inspired his own work, and his love. Through meeting, dating, and eventually wedding, one person’s inherent persistence and drive seemed to feed off the other’s. Together, they decided to pursue their disparate passions, which included expanding the existing winery for Medvedev and opening a second restaurant, in Asheville, for Mai, Red Ginger Dimsum & Tapas. Though their endeavors stretched them in different directions, both literally and figuratively, the couple found encouragement in one another’s work. “When I met her I had the vineyard, but no wine, only grapes,” remembers Medvedev. But with Mai at his side, his visions grew. 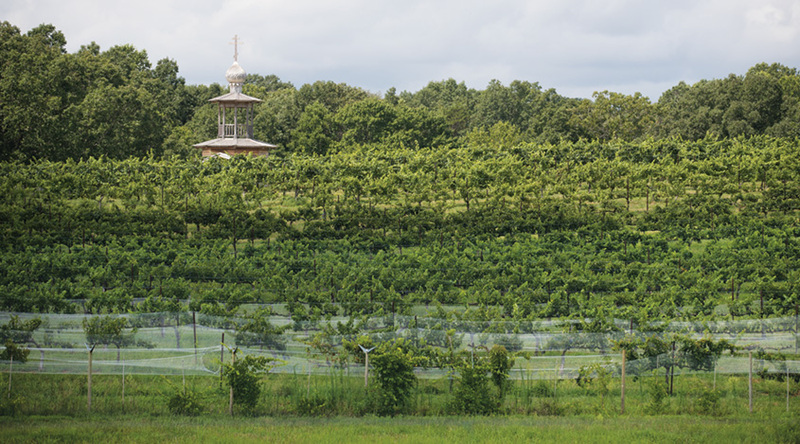 He planted an additional four acres, bringing the vineyard’s holdings to 17 acres. As he awaited the new vines’ profitable production (a three-year timeline), Medvedev dove into research and education. Viticulture classes at Surry Community College in Yadkin Valley (the Carolina’s most esteemed wine region) formed the foundation of Medvedev’s know-how. But it wasn’t simply a course for Medvedev; once again, it was elements of community that served as his true education. He befriended his professor, Gill Giese, a renowned local expert in the wine industry. As his friend and mentor, Giese became instrumental in the establishment of Medvedev’s own winery. Three years after discovering Western North Carolina, Medvedev’s life certainly looked different. He’d swapped his native Russia for the hills of Carolina, his bachelorhood for marriage, his theories of law for knowledge of grapes and vines. Even his estate looked different: Those tenderfooted vines he’d planted in 2010 were a spirited green and ripe with fruit. In 2011 Green Creek Vineyards LLC was officially registered with Polk County as a commercial vineyard. It was finally time to begin production on the wine. Medvedev didn’t cross continents to produce ho-hum wine; he wanted to cultivate the finest vintages within our Carolina soil—which is why he recruited winemaker Jay Adams. With a lengthy legacy in the local wine community, plus a previous tenure with Green Creek Vineyards and a familiarity with the very same soils, Adams seemed to Medvedev to be the perfect accomplice to help make his wine great. “I always joke, he can make alcohol from any liquid! And it’s true,” Medvedev laughs. “He’s pretty well known in this area with wine workers.” For a few days every month, and overtime through the harvest season in September and October, Adams roams the vined hills of the vineyard, lending his expertise to the growth and fructification of Russian Chapel Hills. Together, Medvedev and Adams refined the recipes and techniques to create some of the tastiest tannic vintages in Western North Carolina. “We are trying to do our own style of wine, and it looks like we got it!” Medvedev says. “People like it, and I’ve gotten very good reviews and awards. Most importantly, it’s local wine from this soil.” When the first bottles of Russian Chapel Hills wine were opened and their contents poured onto inquisitive tongues last year, the response was the same from connoisseurs and novices alike: pure adoration. Medvedev and Adams clinked their own glasses in celebration. So what makes Russian Chapel Hills wine special? For one, their wines are entirely estate wines, meaning every piece of fruit that makes its way into a bottle was grown and harvested on site. And those plump grapes are handled with the utmost care and consideration; rather than trust the blind claws of machinery, Medvedev hires help to hand-harvest and hand-sort every piece of fruit. “It’s kind of better too, because when you pick by hand, you can see good fruits and bad fruits. Machines just pick everything,” he explains. The benefits of hand-harvesting don’t end there. “Machine harvesting has to use more chemicals. Small wineries have their advantages, and hand-picking and hand-sorting every single fruit, that’s why we can use only the best fruits for our wines.” It’s a more expensive alternative to complex, clunky machinery, but Medvedev trusts in the process, attributing the wine’s flavor to the delicate and choosy hands that sort the fruit. There’s also a somewhat quirky but telling touch he applies during the processing of the grapes: In the winery’s production building, in a room beside the giant steel fermentation tanks, are a few dozen oak barrels, and during the aging process, Medvedev pipes classical music into the room, essentially serenading and soothing the wine as it rests. Russian Chapel Hills Winery isn’t producing wine en masse—only about 3,000 cases every year, with a capacity of 5,000 cases—but Medvedev maintains that’s another reason for their success. When asked if he plans to grow their production any time soon, he says he’d prefer to keep things small. “Keep this quality. Maybe in 10 years we’ll grow, but for now, it’s my goal to make a stable quality of wine every year.” It’s that old-school prioritization of quality over quantity, perhaps gleaned from that wine culture he fell in love with back in Europe, that sets Medvedev and Russian Chapel Hills apart. Like most modern wineries, Russian Chapel Hills is so much more. It’s not, as Medvedev said, just about wine; it’s about cultivating a community that finds its stable roots in a wineglass. This means the vineyard sometimes serves as a dreamy backdrop for brides decked in white and their nervous grooms. It’s an event space for bachelorettes and ladies who lunch. Tourists and locals alike stop in for tastings on Thursdays through Sundays, from 1PM to 6PM. And it’s an integral destination on the new WNC Wine Trail, which was started by the French Broad Vignerons to support and promote local vineyards and wineries. The winery also hosts a slew of annual events, including a Harvest Festival in August with an I Love Lucy-style grape stomp, and a Veterans Day lunch and service in honor of local veterans. All of those offerings are fairly common among modern wineries, but there’s an aspect of this one that is completely unique, too; in fact, it’s the impetus for the winery’s very name. Set atop the vineyard’s peak stands an actual Russian Orthodox chapel, St. Anna, lending the land the title, Russian Chapel Hills. Medvedev’s promise, made three decades ago, to build a chapel in honor of his fellow soldiers, never left his heart. Through careers, across oceans, united with other passions and new loves, Medvedev’s intentions always rang true. When he purchased the lands of Green Creek Vineyards, with its picturesque sweeping vistas and lushly cloaked hills, he knew he had finally found the place to realize that promise. St. Anna Chapel is an ode to Medvedev’s fallen friends and to his heritage. The initial construction, which took a year, was performed in Russia by a company called Severnoe Zodchestvo, professional woodworkers whose expertise stretches back generations. (“They definitely know what they’re doing!” Medvedev says.) Then the pieces were transported to North Carolina, where they were puzzle-pieced together, without nails, over the course of the following year. The entire construction of the church adheres to traditional Orthodox standards, including orientation with the East. With the help of members of his local parish, St. Nicholas Church in Fletcher, Medvedev chose the name: The Chapel of the Righteous Anna. The final touch came from Prince George Obolensky, of Greenville, who donated his family’s 17th century icon depicting the Entrance of the Most Holy Theotokos into the Temple and, most suitably, Righteous Anna. When construction on St. Anna Chapel was completed, Medvedev officially changed the name of his business from Green Creek Vineyards to Russian Chapel Hills Winery. And in a sense, the Chapel has also permeated the very soil and soul of the winery. Though Medvedev’s personal favorite of his wines is the Cabernet Sauvignon, the most popular is their Kagor, which is a Russian Orthodox Communion wine. “Now it’s my best-selling wine; people really like it as a dessert wine. It’s very sweet and pretty high alcohol,” Medvedev explains. “I’m very proud. I’m the official supplier of [numerous] Russian churches on the East Coast! All these Russian churches buy my communion wine.” It seems almost implicit that the winery supplying the communion wine of dozens of churches across the East Coast is also home to the region’s only Russian Orthodox chapel. When Medvedev toured Europe’s wineries all those years ago, it was the culture and community that grew around the vines, as much as the vines themselves, that inspired him. And today, it’s a similar feeling that inspires all aspects of Russian Chapel Hills, a reflection of generations of winegrowers everywhere. It takes much more than just Medvedev’s mind to make these wines a reality; it’s the combined contributions of many. He has sold grapes to Biltmore at points in the past. Then there’s Jay Adams, of course, who lends his heart and head to the award-winning wines. Medvedev also receives a lot of assistance from a church member, Abraham Cluxton, who now lives on the property and takes care of the handy, hard working tasks. (Cluxton, an entrepreneur in his own right, was profiled in the October 2015 issue of Capital at Play, talking about his business Cluxton Caskets.) Medvedev also still leans on his old mentor, Giese, for occasional advice. And even the wine bottles’ designs come from a recently-made friend and neighbor. And flavor of the Carolinas it is: Honeyed ambrosia, so to speak, tapped from our own soils, but also holding the blackberry sweetness of Italy, the tart bite of Russia, and even the dusty charcoal of Afghanistan. Corked in blown bottles and swirled in tender-stemmed glasses, the flavors—and the communities that made them—become one.